A total of 980 new homes for Pagham could be approved across three separate developments within the next fortnight. Taylor Wimpey is looking to build 280 homes north of Sefter Road, Hallam Land Management wants permission for 300 units between Hook Lane and Pagham Road while Hanbury Developments is planning 400 dwellings at Bartons Farm south of Summer Lane. The three developments have been vehemently opposed, generating nearly 3,000 combined objections. The three outline planning applications are due to be discussed at a special meeting of Arun District Council’s development control committee on Wednesday October 24. Officers are recommending approval subject to conditions in all three cases. All three plans include land for a primary school but West Sussex County Council has expressed the Summer Lane development as its preferred location as it would be closer to the centre of Pagham. 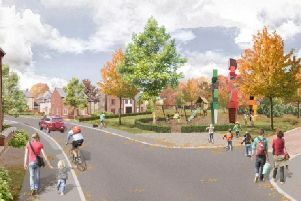 The Summer Lane development also includes provision of a 70-bed care home, local centre and scout hut. An 80-bed care home is also contained in the Hook Lane scheme, while the Sefter Road application has land available for a care home, ambulance community response post facility and replacement scout hut. All three developers have agreed to make contributions to Highways England for improvements to the A27 Whyke roundabout at Chichester. They would also fund improvements to the Rose Green Road junction, widening of the B2166/B2145 as well as widening the Vinnetrow Road/B2166 roundabout. Southern Water said it cannot provide foul sewage disposal to service the Hook Lane development as the Pagham wastewater treatment works does not have the capacity. However it advised the applicant to examine alternative means of disposal. Arun planning officers suggested flows could be diverted to waste water treatment works at Lidsey and Ford. Financial contributions are also being sought for the Grove House GP Surgery, however legal agreements have been worded to secure various potential solutions. These include a new healthcare facility as part of the West of Bersted strategic site, expansion or improvement of Grove House or either expansion or relocation of the Sir Arthur Griffith clinic in Pagham.